An acoustic guitar, flute, and vocal version of REPLAY carry the same great live classic rock energy in an unplugged format for smaller venues and parties. 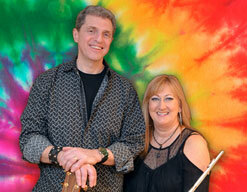 Mike and Sharon provide a lighter sound for a heavy duty good time. Contact Sharon at Sharon@Replay1234.com to book REPLAY!